Would you like me to capture your memories as a commission piece, or a special occasion package? Click here and let’s talk about creating your own painted memories. Painted Memories allow you to preserve and enjoy those special places, pets, people or events for years to come. I am happy to create commissioned “one of a kind” artwork for you, using your own photography*. I can also do the photography myself if your subject matter is local. Other elements, or background photos can be incorporated at a small extra charge. *IMPORTANT: Please be sure that you own the copyright to your images – either you took the photos yourself, or you have a copyright release from the original photographer. Charges for design work start at $100.00, with an additional $40.00 for each extra photo if you want more than one combined into a composite image. Photography is charged at $50.00 for up to 4 images, plus travel. I do ask for full payment of the design fee (and any photography charges) in advance. Charges for wall art production are standardized. The price is based on the “square inches” of the piece (height x width) for smaller pieces, and the “linear inches” of the piece (height + width) for large works. Once the design is complete, we can determine the best medium for displaying your commission piece. I recommend printing on a glossy aluminum panel. The resulting image quality is simply stunning, similar to a high definition television picture. But if you prefer something a little more “old school” I can also have your artwork produced on stretched gallery wrapped canvas. Of course you are also free to choose an alternative medium – a glass canapé platter, a cocktail cutting board, or a throw pillow for example. To determine the best size for your finished work, read my blog post concerning tips for hanging art. It is important to have an idea of size before the design work starts, to make sure that the final image is proportioned appropriately. If you are considering a cluster of images, then apply the sizing rule to the entire group, as if it were a single picture. Commission piece incorporating client’s photo, text and stock imagery. Thanks so much, Julia. Everyone loves the picture! It was wonderful to work with you. I was so pleased that you were able create a beautiful work of art from our beautiful memories. 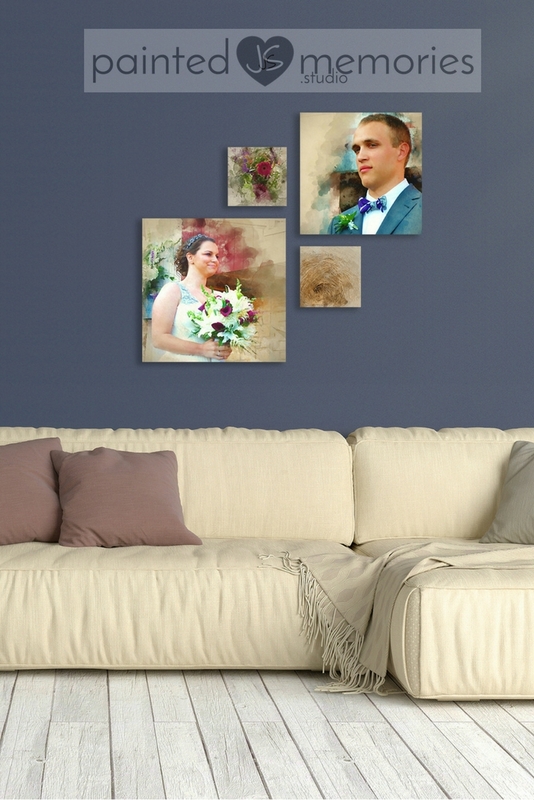 I can create wall clusters or galleries using one or several photos from your special occasion. Do your friends like to share their photos on Instagram? Give them a unique hashtag for your wedding, and ask them to tag their pictures with #paintedmemories and your tag, so that you can access them all to make your selection. Please let them know that you may be using their pictures for your wall art – chances are they will be thrilled to be included.